This mount was recently found at Ardersier, and is now in Inverness Museum. It is decorated with an interlaced animal with an almond-shaped eye in a Norse style called ‘Urnes-style’. Brooches and mounts in this style were mass produced in Scandinavia between 1050 and 1150, with moulds found at Lund in Sweden dating 1100-1150. Similar animals also appear on Scandinavian runestones of the period. Brooches in the openwork style have been found throughout the areas the Norse travelled, with fine examples in silver known. There are few Urnes-style mounts or brooches in Britain, however, although the style did give way to an English variant which was often plaed on stirrup mounts. 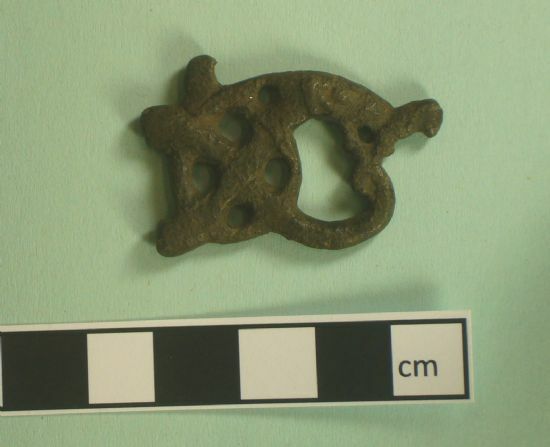 The Ardersier mount is copper alloy, rather than silver, and it is not clear what it would have been attached to. However, the beast is well drawn and sinuous, and when polished, it would have been a striking, and probably fashionable, accessory. No other examples are known from Scotland, as far as I know. This brooch dates centuries after the main Viking raids on Scotland. Was it a chance loss by a traveller using the ferry crossing between Ardersier and Ross-shire, which has a long history? Was it a find from England, brought up with the Norman lords who were pushing into this area around this time? Or does it relate to the rebellions against the Scottish crown in Moray at the time, which were probably supported by the Earls of Orkney? All would provide a context for this lovely find. Owen, Olwyn 2001. 'The Strange Beat that is the English Urnes Style,' in Vikings and the Danelaw, ed. James Graham-Campbell et al., pp. 203-222.